Red, White, and Blue and yummy too! How perfect are these for your 4th of July Celebration?!! Just a note about homemade whipped topping - it's awesome! Well worth the little bit of extra effort! 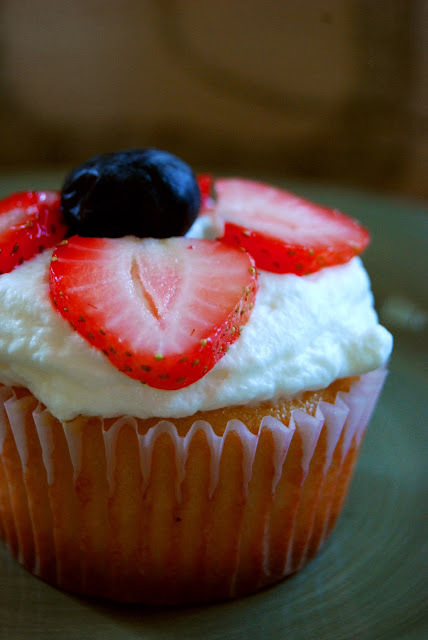 To fill and decorate cupcakes, use a thin paring knife to cut a small hole, about 1/2 inch in diameter, into the top of a cupcake. Insert the knife about 3/4 of the way down into the cupcake, and remove the core. Use the pastry bag to fill the hole with pudding, piping in enough pudding to fill the hole flush with the top of the cupcake. Frost the tops of the filled cupcakes with whipped cream (see recipe below), spreading it into a smooth layer. In a chilled small mixing bowl and with chilled beaters, beat cream until it begins to thicken. Add confectioners' sugar and vanilla; beat until soft peaks form.